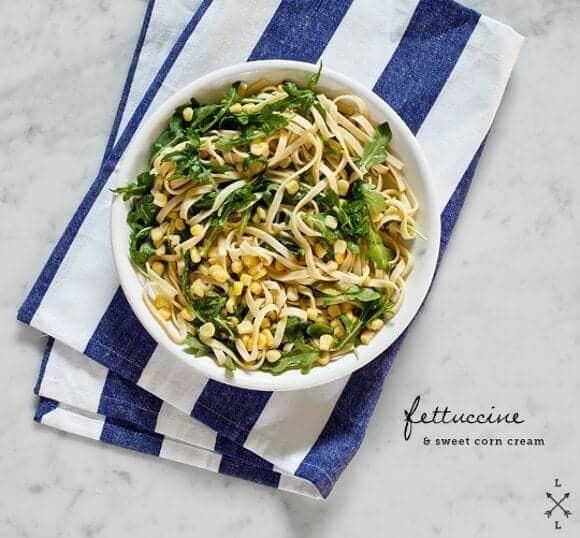 Fettuccine tossed in almond & corn cream sauce with greens makes a perfect summer dinner. Lighter than a dairy cream sauce but no less delicious. Vegan. Oh, corn… if you’re not from the midwest, you don’t really know corn… in the same way that if you’ve never been to southern Italy, you’ve never truly experienced a tomato. Jack doesn’t “get” corn. But he’s from Florida, so he never grew up with late-July anticipation of the sweet, crunchy, juicy goodness that is Illinois bi-color corn. (And truthfully, I think the closest he got to “corn” as a child was via Frito-Lay). If I had peak-season Illinois corn, I wouldn’t even be cooking it this much. 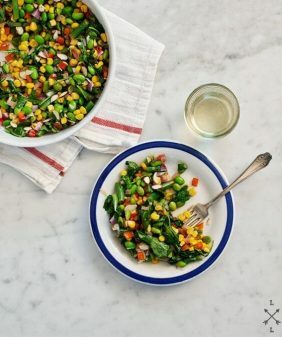 This is a summery dish you make when you live somewhere that doesn’t have Illinois corn (or you could even use frozen corn). We have this pretty good corn in Texas right now. I usually eat it doused with chipotle chile powder (another good application for “pretty good” corn). But this time I was craving something a little bit more subtle. This creamy sauce, made from corn and almonds, is luscious and a just tad bit rich… but on the (way) lighter side than traditional creamy fettuccine. I tossed in some spicy arugula for contrast…In case no one’s noticed, I’m kind of an arugula addict. Bring a large pot of salted water to a boil and cook the pasta until al dente. Drain and rinse, reserving at least ½ cup pasta water. 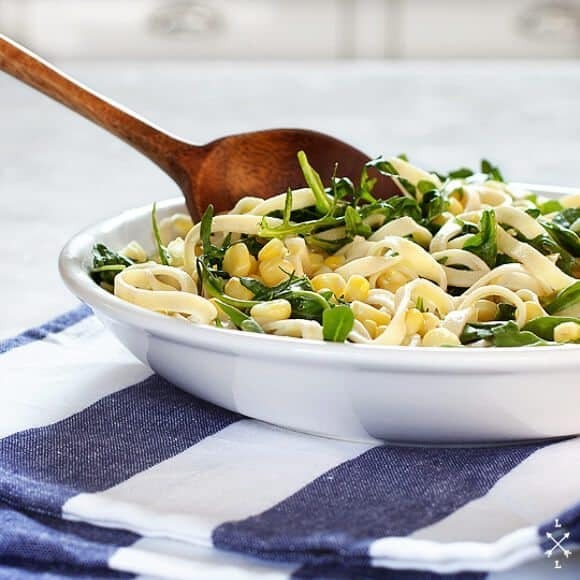 In a large bowl*** place the loose corn kernels and arugula. Scoop cooked pasta noodles on top along with some of the reserved starchy pasta water. Spoon in the almond cream, a little at a time, along with more pasta water, tossing as you go to wilt the arugula and thin out the cream sauce. Continue, adding more sauce, salt, pepper, the basil, another few squeezes of lemon, and the red pepper flakes, if using. Taste as you go. Use as much or little of the cream sauce as you like. This can be a very light dish, or a more rich one depending on what you’re in the mood for. *To blanch the almonds, drop in boiling water for about 30 seconds, remove and transfer to a bowl of water filled with ice. Skins should slide right off. **The corn flavor will intensify if you let the sauce sit for a bit. Store in the refrigerator until ready to use. This can be made up to 2 days in advance. ***If you made the sauce ahead of time and it is cold from the refrigerator, you might want to mix everything together in a large skillet with a little bit of olive oil over low heat instead of a bowl so that your final dish is hot and not lukewarm. You are so right about Midwestern corn. Around late July/early August I dream of driving back to Ohio for one of those meals that consists only of fresh sweet corn, home-grown tomatoes, and peaches from Grandpa’s tree. I’ll be trying it this summer! Oh, how I dream of getting a Vtamix. I always enjoy pasta tossed in light sauce like this one. 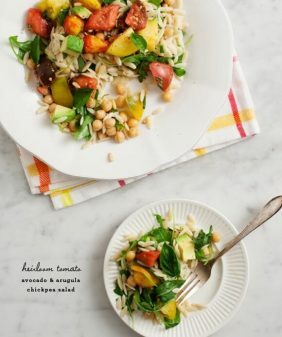 this looks totally delicious and the pictures are incredible – i love the colors. hi-5! gosh, here in New England Sweet Corn is eagerly awaited for come August/July – there is nothing better then fresh corn, the kind that needs no cooking, so sweet and tender you can eat it straight up! 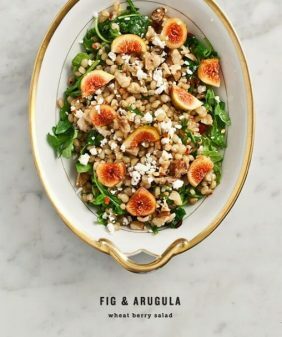 I Love tossing arugula into everything – it brightens up any dish that simply needs a little “greeness”, your dish looks absolutely simple and grogeou, I love how you added the almonds for a bit of creaminess – perfection! YUM! I am a total pasta-aholic! That sauce sounds so amazing and like nothing I have ever tried before. Once the corn is in season here, I am most definitely coming back to this recipe. I think a dish like these needs that aragula as a perfect complement to the creaminess of the sauce. 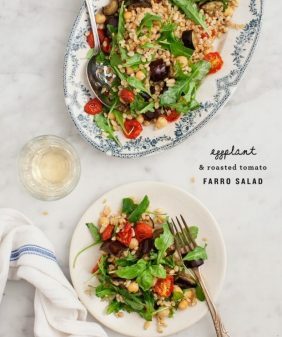 This sounds like summer on a plate. Delicious!!! CORN 🙂 Best summer vegetable!!! This sounds delightful! Great idea! This is making my mouth water!!! Yum! I will be picking up fresh corn at the farmers market this week for sure. I love this idea; I’ve made a creamless alfredo sauce from pureed cauliflower that was acceptable, but this seems like the perfect means to deal with the abundance of corn right now. Being a born and raised Minnesotan, fresh corn, bought from a truck on the side of the road next to the cornfield is a regular occurrence. We generally consider it a birthright. And that juicy freshness lasts only a brief while. I always hope by the time the season is done that I’m fed up and full of fresh sweet corn. This recipe will help that along. Oh, I love this idea! We’re big corn lovers here in the Midwest too 🙂 We’ve never tried it in pasta though, and are always looking for ways to have less rich sauces. Great idea! Such a beautiful summer pasta! Being from Minnesota I completely understand the whole Midwest corn thing. It’s really not the same anywhere else! 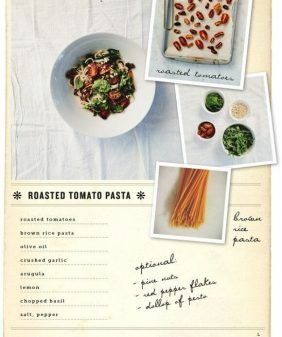 Also, this pasta looks so delicious- I could definitely see it becoming a summer staple around my house! I made this tonight for dinner and it was really great. I had to use cashews instead of almonds but it was still yummy! 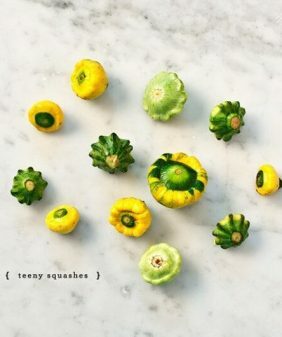 I’m new to your blog (discovered it after one of my facebook friends commented on your recipes). I’m so excited to have found your site since my vegan diet has been reduced to smoothies, plain steamed veggies, and hummus. Ugh! You’ve inspired me! WOW! I am going to make this this weekend! I just picked up some sweet corn yesterday. this was great! don’t have a vitamix, so it was pretty grainy, but the taste was really wonderful! full disclaimer – i don’t really follow recipes, so i changed a lot, but i could tell that this is a keeper! This was so good! I have a lot of sauce left over, do you think I would be able to freeze it? Thanks!! I’m so glad you liked it! Hmm, I can’t say for sure (it might separate as you thaw it). It should last in the fridge for the rest of the week (stir it if it gets watery). If you do try to freeze it, let me know how it works out!